Five hundred rounds of Federal Game-Shok Ammunition 22LR (Long Rifle) 31 grain Copper Plated Hollow Point Bullets? Yes Please. These Rounds have long been regarded as one of the top of the line bullet types on the market and now you can acquire them in large numbers! 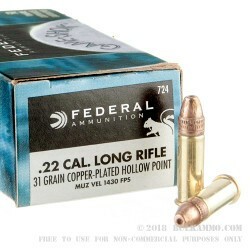 Ideally suited for and designed for small animal and varmint hunting, these Federal 22LR rounds are the companion you want on your next small game hunting excursion. 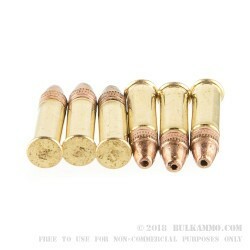 This 22 long rifle ammo comes topped with a 31 grain Copper Plated Hollow Point, and new, reloadable (with proper equipment and training), non-corrosive rimfire primed brass cases. The muzzle energy of these rounds is 141-foot pounds and the muzzle velocity of these rounds is quite fast at 1,430 feet per second. 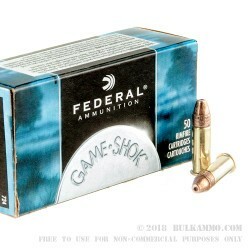 In addition to being a great small game hunting cartridge, these rounds are also great for plinking, or for taking the friends out to your local range to do some shooting. And because the recoil impulse is next to nothing, you can also take your family out to the range without anyone having to worry about the “kick” or recoil. Whether you’re using these rounds as a way to get your kids started in shooting, hunting, or just having fun, these Federal Game-Shok 22LR rounds are perfect to take with you for many activities. Get your 500 bulk packs today! 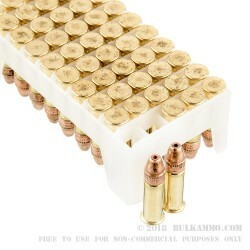 Q: Can this ammo be used with my Ruger .22? A: Hello Diana, Yes this .22 LR ammo can be used in your Ruger .22.